When is a democracy not a democracy (2)? "Well, they probably don't have that many Oxford graduates to choose from" says jules. Another one of this strange collection of papers has an odd attempt to estimate climate sensitivity by Chylek et al, which has recently been published. where H is the total heat anomaly (dominated by ocean heat uptake), F is the forcing anomaly and T the surface temperature anomaly (note that my notation is slightly different from theirs). Here l = 1/S is the radiative feedback parameter, the inverse of climate sensitivity S. At equilibrium, the LHS of equation (1) is zero and so the formula T = F/l gives the equilibrium temperature change for a given forcing. where the D indicates the decadal trend (it's a greek Delta in Chylek et al). which is the expression that Chylek use to diagnose S using data from the past decade. which implies that (in order for the equation to be valid) the surface temperature must always be directly proportional to the forcing - with constant of proportionality 1/(l+k) - and thus is instantaneously in equilibrium with the forcing, with no lag. These latter two expressions (7) and (8) are only compatible if k=0 (which it certainly isn't, and Chylek never claim it is). So we have a contradiction here. The fundamental problem is that the expression dH/dt = k.T is only a plausible approximation under certain circumstances. Chylek's formula (5) cannot be used as a general expression to diagnose the sensitivity of the climate system, as it gives nonsensical answers when forcing does not follow a steadily-increasing profile such as that of the CMIP (1% pa) experiments. There is no justification in their paper as to why their expression should be accurate when applied over the last decade, and I'd bet dollars to doughnuts that it fails to usefully diagnose sensitivity when applied to GCM output such as that in the AR4 database (I've not bothered to do this). So in the absence of any evidence that their method actually works, it's hard to take their results seriously. I haven't even started to talk about how sensitive their calculation is to natural variability noise, which they have not accounted for either. When is a democracy not a democracy? After the last election, 185 of 480 Diet members (39 percent) were second- or third- (or more) generation politicians ('seshuu seijika'). Of 244 members of the LDP (the ruling party for practically the entire postwar period), 126 (52 percent) are seshuu seijika. Likewise eight of the last 10 prime ministers, and around half the Shinzo Abe and Yasuo Fukuda Cabinets. When the average turnover of lawmakers per election is only around 3 percent, you have what can only be termed a political class. Debito is a bit in-your-face but rarely significantly wrong in his facts, so I see no reason to doubt these figures. I'd be interested to hear of equivalent stats for other countries. I know that in the UK "Fatty" Soames is related to Churchill, for example. And of course the USA has its dynasties of Bushes, Kennedys and Clintons (although perhaps the last ones were both destined for politics before they got together). There's a Mussolini in Italy, but I can't help but think that the fame of these few cases may be a sign of their relative rarity. Correspondents say the law will deal a blow to themed resorts across the world where large-scale copies of Egyptian artefacts are a crowd-puller. This correspondent says the law is a joke or political stunt that will have no effect outside Egypt's borders. Obviously. Hmm...on the other hand, maybe the Scottish parliament should charge worldwide royalties for users of pneumatic tyres, tarmac roads, televisions, bicycles, penicillin, and deep-fried Mars Bars...they'd probably have to go halves with Italy on deep-fried pizza though. That was "Christmas: 1924" by Thomas Hardy. Happy turkey-stuffing to you all. OK, enough joking around. I was actually there for work, having received a generous invitation to present at the session on "Climate Sensitivity From Modeling, Current Observations, and Paleoclimate Data." We've often thought about going to the AGU Fall Meeting, since while we are in Japan it's actually more convenient than the EGU, but never previously got round to it. The organisation is rather different to the EGU, and took a bit of getting used to. For some reason, the poster sessions are not clearly linked to their corresponding oral sessions (the code numbers indicate the section and the time, but eg there is no obvious link between U43A and U51B, despite them being posters and oral session on the same topic). They don't even arrange things in alphabetical order in the book. There is also no Climate section and very little Nonlinear Geophysics (the two most interesting sections in the EGU), but a whole lot of Paleoclimate. Here are some highlights from my notes. Errors and omissions all mine, of course. After a couple of paleoclimate talks first thing on Monday morning I ducked into a rather bizarre session entitled "Navigating a Career in the Geosciences: Strategies for Success." It started off with some important successful guy telling us how the rewards would come if we just put in enough hard work and perseverance and were prepared to take our chances. He told us his own life story of how there were not enough jobs in his PhD speciality, so he changed topics. Then he found funding hard to come by in his next field...so he changed again, becoming Director of NCAR. Why didn't we all think of that? The next presentation was a similar pep-talk from another senior professor about how great life was if only one persevered, but the last talk actually did have some useful content based on real research about what distinguishes the more successful from the less. But I'm hardly going to give away the secrets to you lot :-) One of the most important factors seemed to be the Y chromosome, which reliably distinguishes the "outstanding" from the merely "hard working" (Trix and Psenka, 2003). Later on that day, a session on extremes had Tom Knutson sounding rather sceptical about whether or not hurricanes were likely to increase much (and he thought it would take some time to see a signal in the data). Tuesday morning started with a session on aerosols, not really my thing but I'd spotted both Schwartz and Chylek were presenting, so I turned up to listen. Steve Schwartz presented his sensitivity analysis, but admitted it had received a lot of criticism and he would not "bet the ranch" on it, which probably defused some potential criticisms (in the questions after someone did say that they thought his detrending was a dodgy step). Later on in the week I spoke to him in person, he said he'd just got our comment and hadn't yet planned his reply. Petr Chylek presented a somewhat similar paper from in the same special issue of JGR (guest editor: P Chylek) which I'll probably blog about in more detail later. I got the impression of a bit of a clique separate from mainstream climate science here. Someone in the audience actually asked where they might get the opposing point of view. It wasn't 100% clear what they meant by "opposing", but one good answer might be chapters 9 and 10 of the IPCC AR4 WG1, or indeed the whole book. There was also a session concerning use of the multimodel ensemble (ie the AR4 runs), which I am getting interested in. In fact there were a few sessions with this sort of flavour that during the week. After 2 consecutive 10h days and fairly late nights, Wednesday morning had nothing much of interest so we had a lie-in (and tested the crappy hotel gym). The afternoon had some stuff on ocean tracers, including some adjustments to the ocean heat content data, and also estimates of ocean mixing based on various other tracers (tritium from bombs, helium from the mantle). This is something I've tried to point out to some climate sensitivity estimation people who claim that we can't say much about the ocean mixing rate (and thus heat uptake, which affects climate sensitivity estimates) because the temperature data are so uncertain. Even if the direct measurements of temperature are uncertain, we have other evidence about the mixing rate, which they studiously choose to ignore! Thursday morning had some fun stuff on carbon sequestration, including various air capture schemes. I'm not really convinced that these make sense, but I've nothing against their consideration. Rather than harvesting and burying biomass, it might be simpler to just use it for energy in place of the fossil fuels. In the afternoon we had the exciting session on "Tipping points", which started off with a well-attended talk by Jim Hansen. He didn't actually talk about tipping points in much detail but argued for a rapid halt to coal use (unless sequestration-enabled). Friday morning was our big thrill of the week, with presentations in the session on climate sensitivity. I was due to talk 2nd up, immediately after Jim Hansen, which (as is generally the case in these situations) I presumed would mean a mass exodus throughout my talk. I consoled myself with the thought that at least most would hear the start of it. Anyway, we arrived bright and early, checked that our presentations were set up and bagged good seats. At about 8:02 the convenor stood up, and said that she was very very sorry, but unfortunately Jim Hansen's presentation wasn't ready yet, so we would have to start with the 2nd presentation! Well at least that saved me another 15 minutes of nerves, and since Hansen's presentation was "in the pipeline" people didn't have time to run out for a coffee so I had a packed house. When initially invited, I'd really planned to steal jules' paleo work and talk about that, but then she also got a talking slot in the same session so I had to leave that in her hands and revamped the "Can we believe in high climate sensitivity" stuff instead. I had some fun reading a bit of Steven Goodman's Nature letter ("This technique would be a wonderful contribution to science were it not based on a patently fallacious argument, almost as old as probability itself") against a back-drop of quotes from the recent climate science literature all claiming that uniform priors represent a state of pure ignorance (this of course being the patently fallacious argument Goodman was ridiculing). Lest anyone think I was picking on anyone in particular, I quoted from 3 papers from largely different groups, plus an extract from the Nobel-winning consensus of 2500 climate scientists otherwise known as the IPCC AR4. However I had noticed that Myles Allen was supposed to be talking straight after me, and I was disappointed that he did not attend and defend his beliefs. I guess if I keep on turning up to the major conferences we can't continue to miss each other indefinitely. The rest of the session had a mix of old and new stuff, nothing too revolutionary. We wound down with a session on geoengineering which was fun. Nameable names that I met for the first time (mostly very briefly) included, in no particular order: Steve Schwartz, Ray Pierrehumbert, Michael Tobis, Michael Mann and of course there were numerous others I've met before. 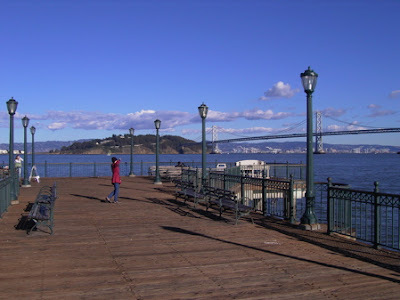 The weather was great and SF is easily the nicest city I've visited in the USA (not that I'm very well travelled over there) so we thoroughly enjoyed ourselves. On scientific grounds, I think I prefer the EGU, but maybe that is partly a matter of familiarity. Apparently women scientists are all very very unhappy. James pointed me to the "I am woman I do science and I'm not telling you my name" blogs. I even subscribed to one. But I'm giving it up. I find it boring. I'm not sure if it's the anonymity or the boasting about how great their science is that bores me most. Or is it really that I just don't share any of their experiences? As far as I can make out they all live in countries which actually have anti-discrimination laws, where many women can have careers, by which I mean not just a job with no prospects where they are treated basically as slave labour and blamed for everything which goes wrong. In fact it seems that in their countries any women with a degree can expect to have some sort of career! wow! I was really starting to wonder how can they bear to almost everyday write another post about every perceived unfairness in their lives when I came across this post. And it was at that point I realised that for the last 6 years I have been living their dream. I'm not very girly by nature. Once a year I go away to the "Women's Conference" at Amagi Sanso to see what women are like. I really enjoy that, especially since it is only 2 days long. Americans are so noisy! :-) My status here is foreigner first and woman, well - I don't really count as one of them at all. Luckily. Women in Japan get a really bad deal. Here I am treated equally with James. This was not how it was in the UK, but to be honest I think their problem was more that they liked to put all their workers into little boxes ... and the memory is fading. Everyone here takes my scientific opinion as seriously as anyone else's - actually more seriously in some ways, because I'm a Westerner. And yes, all you girls, who so sadly have never experienced this, it's great. After a while you start to get less angry, less shrill, and to take people as you find them. You start to think before you speak because you realise that when you speak people will listen and act! That bit is a real shock the first few 100 times it happens. So, bloggy sci-wimmin with side degrees in wimmin's stuff, please come to Japan - Japan seriously needs feminism! Well I think it does - the Japanese female workforce is seriously under-employed, and by the same token the men are employed above their natural station. I tried pointing out to my female friends that Japan is 91st in the world in male-female equality but they didn't seem to react at all to the news... which was very puzzling. Bring in the pros! Here's something to keep you amused while I compose my summary of the AGU. It's from one of the presentations I attended. The left hand side shows global mean surface temperature from an 800 year integration of a well-known climate model (click on the pic for a larger version). The puzzle is to identify what the colour changes represent, and what caused the climate change. 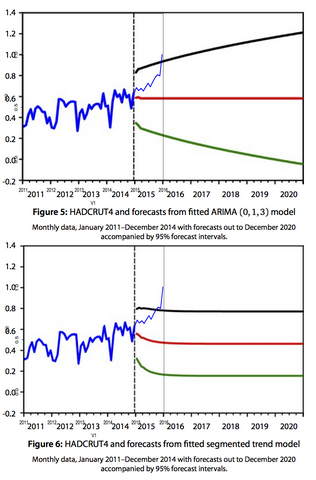 The right hand pic (from the IPCC AR4) is simply to provide some context on the vertical scale, it has no direct relevance to the puzzle - note the horizontal scales aren't the same either. Those who actually know the answer are invited to not answer too soon, so others can have the fun of trying to work it out. 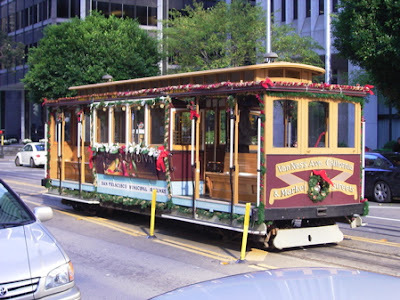 We set off on Saturday afternoon, arriving early the same morning in San Francisco. After checking in at the hotel, we stumbled around town trying to ward off sleep for as long as possible. We had the one disastrous culinary experience of the week, a truly awful sandwich in Lefty O'Doul's just off Union Square - a monstrous wedge of cold, virtually raw (and definitely unchewable) beef between a couple of doorstops of bread made soggy with a smear of cold gravy (to be fair, my pastrami, beans and mash was just about ok, but still rather tepid). Things could only get better...and after a ride home on the California Street cable car, they did, with a tasty snack in the hotel restaurant before an early night. On Sunday, we found a tandem to rent on Fisherman's Wharf - nothing special, but perfectly serviceable and just about large enough for me. 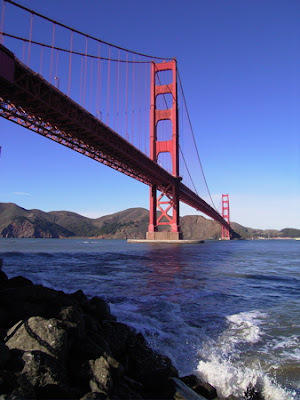 So we cycled over the Golden Gate bridge in brilliant sunshine, and caught a ferry back after an ice cream in Sausalito. What a great way to spend a sunny day in San Francisco. Monday night's treat was dinner in the much-hyped "Slanted Door" restaurant - it was good, but probably not really worth all the fuss. Tuesday featured a few beers in the Thirsty Bear followed by a curry with a group of friends. On Wednesday we were back in the TB for lunch, crashing a private Texas University party (no, we were invited by mt, honest) and then off to the circus in the evening. 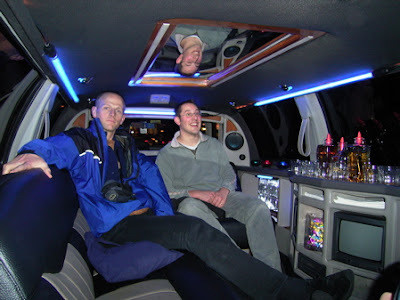 We were going to get a taxi there, but Dan decided we should travel in style and flagged down a stretch limo instead. On Thursday we had a quiet night back at the hotel, in preparation for an early start on Friday - did I mention we were at a conference? - and on Friday afternoon we celebrated the end of the week with another trip to the Thirsty Bear followed by a rather good Asian-stylee "fusion" meal at a nearby restaurant. You might notice a bit of a theme here in our choice of watering hole - we were a little disappointed in the local beer, which (as it had recently in Colorado/Utah) mostly seemed about on a par with my mediocre home-brew, but the Thirsty Bear was exceptional. Saturday saw us enjoying 12h of stress positions in a Japanese-sized airplane seat (would be illegal in Guantanamo Bay) which made the trip feel like 29h but we eventually got back to Japan by Sunday afternoon. Overall it was a fun trip, I'm not sure whether we'll be back next time but San Francisco is a great place to visit. I'll not fly ANA though if I can help it. Many carriers these days sell the exit row seats for a modest premium, and sometimes I get one for free if I turn up early enough and ask nicely. ANA just sat random midgets in them, even though their feet barely reached the ground. The food was awful, and they even woke us up a full 3h before landing. On an 8h flight that doesn't leave much time to sleep! For the longer version, see here. It's perhaps as interesting for who hasn't signed, as for who has. I know climate science is western-dominated as a field, but it is slightly surprising to me that the organisers did not make more effort to reach out globally - I count a total of 2 Indian signatories, zero Chinese, and 2 Japanese (oceanography types whose names I do not recognise - I'm sure that reflects more on me than them). One Indonesian rounds out the Asian contingent. In contrast, there are 7 Canadians, 10 Swiss, 11 Norwegians. Yes, there are more than twice as many signatories from the global powerhouse of Norway (population: 5 million) as there are from the entirety of Asia (population: 3.7 billion). I'm not going to start counting the French and USAian signatories. They even found someone from the Faroe Islands and three Belgians (do you know three Belgians?)! Well, I don't quite want one like this, but I can see a time in the future when they are a practical proposition. It's encouraging to see people are actually developing these things commercially (as opposed to the odd home-brew like this). Of course for scientific meetings the ideal would be to rent one in-situ rather than own your own and post it around the world. Meanwhile, the AGU is offering a handful (only) of presentations from the upcoming meeting on webcast (see here), and Nature is doing something on Second Life to coincide with Bali. I can't see the latter catching on - the only reason the bureaucrats have international meetings at all is so they can go somewhere exotic (I'll eat my hat when the UN has a conference in Scunthorpe or Wigan). JAMSTEC has a "booth" there, apparently (Bali, not Scunthorpe). Pity the poor sods who have to man it...not. Not that I'm in a position to throw stones, heading off to the AGU tomorrow. Honestly, I would pay good money to avoid travelling there in person if there was a viable web-based solution. Brian has already blogged the details. and so has William. All three of us are joining forces to oppose Joe Romm's claim that the Arctic will be essentially ice free (down to 10% of the historical mean minimum) by 2020. Brian originally bravely offered to stake a spare button and an old stick of part-chewed gum. William offered up $500, and I suggested $1000. At this point, Brian decided he could be a bit braver and Joe started to sound a bit lukewarm. In the end we agreed to evenly share $1000. It is interesting to observe, and experience, how the contemplation of putting down hard cash (even if not very much) focusses the mind! I don't even have a strong view on the short-term fate of Arctic ice. But for that reason, I think it is unreasonable to claim that all the models and research (which suggests ice-free around mid-century and perhaps later) is badly wrong. I wasn't planning this as a deliberate hedge, but I certainly don't think I can lose both this bet and the original warming v cooling one. At Weather Action we are forecasting at the frontiers of Sun-Earth weather and climate science and are 90% confident there will be a major storm in the period 24th-28th November and the public should be warned and preparations made. The main threat to Holland, as before, is sea defences which will be under attack from the North Storm Surge we predict - and the next one is likely to be worse than the last one. Further to the letter I sent at the end of October warning of impending dangerous storms – including explicit warning of threats to sea defences (especially in view of new and full moon high tides at the same times) and tornado type developments in the periods 8th-13th November and 24th-28th November I am writing with an update which can help you prepare via COBR (Cabinet Office Briefing Room) for potentially dangerous severe weather which is likely to hit the UK in the period 23rd to 26/27th November (slightly earlier timing). Given recent confirmation of expected developments in Sun-Earth relations we are now over 90% confident that there will be major damaging storm(s) including serious risk of breaches of sea defences* in a number of parts of the UK in the period 23rd to 26/27th November and therefore it is in the public interest for those involved in Emergency Services - and the public - to be given maximum advance warning. We make this information freely available in the public interest. (* NB Full Moon 24 Nov 14.31hrs). The first storm wave is now showing on forecast maps for Friday 23rd/Sat 24th Nov. AS PREDICTED. The situation is also open for the second storm wave to follow. 1. Standard meteorology will underestimate winds and rain even from 24hours ahead particularly for forecasts of weather in period 24th to 28th Nov.
Our estimation of top gusts over 90mph very likely in the region of the storm track remains, with 100mph likely to be topped in exposed North sea/Island/and perhaps some headland parts. 2. FORECAST USERS should note our projected storm tracks and short range information for estimating top gusts in their area. From 24 hours ahead standard meteorology will probably be reasonable about storm tracks but underestimate wind strength and rain. The core regions under threat in our long range forecast map for Storm wave 1 remain Scotland, parts of NE England and Central/South Norway and - to a lesser extent - North Denmark. Forecast Users in Holland and Belgium please note that they were never forecasted to be in the core storm track for storm wave 1 and will not be in it. (Wave 2 is likely to be more important in wind terms for Holland and Belgium). The main threat to Holland and the East/SouthEast coast of England from storm wave 1 (and probably also storm wave 2) will be the North Sea storm surge which will coincide with a series of exceptionally high tides - close to highest possible tides on and after 24th November. To Emergency Services, Local Authority Risk managers, media and WeatherAction forecast users. The period is on the 304th anniversary of the devastating Tempest of 26th/27th (modern calendar) Nov 1703 in which thousands died mainly in Bristol, the South coast of England and London, and Portsmouth was destroyed. Although there are some similarities concerning solar forcing factors of storms developments, events of that magnitude are NOT forecasted for this period. At the time of writing (25th Nov 22.00hrs), deep low pressures are developing -as forecasted - over the Atlantic and short range standard forecasts show 'dartboard' (exceptionally deep - eg 955mb*) lows. Predicted solar effects make the present period one of rapid and accelerating weather change for the whole of the north Atlantic region from Greenland to St Petersburg and from North Norway to Belgium which will often get ahead of standard meteorology forecasts. For those who don't know the region, the UK generally has a wet and windy period around now. The local name for this phenomenon is "winter". My own patented long-range forecasting methodology(*) enables me to exclusively reveal here, for the first time, my prediction that "winter" will return in November/December next year. With 90% probability, anyway. (*) Sadly the margin of this blog post is too small to contain the marvellous proof of the skill of my approach. Do you know why riding a tandem is illegal? I think it's probably because they are dangerous. Why do you think they are dangerous? They must be, because if they weren't, they wouldn't be illegal. What a blessing it must be to have such blind faith in the infallibility of the legislative process. Another rather odd law is the one against home brewing beer (kits are widely sold, but using them is criminal). That's because the major brewers don't want their cash cow milked. of course. And there is plenty of outrageous and discriminatory legislation, like the Basic Education Law that guarantees an education to all children in Japan...so long as they are Japanese. But that is just evil and racist, not completely hatstand in the way that the anti-tandem law is. Most of the crazy UK legislation turns out on further investigation to be an urban legend (like the one about being able to kill Welshmen after dark in Chester, so long as you use a bow and arrow). But I'm sure there are some genuine oddities both there and elsewhere in the world. Contributions please! Many of you have presumably noticed that BBC environment correspondent Richard Black has written a bit about climate change "scepticism" recently. I think the first article was this one, which described his attempts to get some sense out of the sceptics, and then there was this "top ten" of sceptic arguments. As Gavin (who helped him on that article) says, that top ten was a pretty lame affair. That's not a criticism of Richard Black, but rather an indication of how completely irrelevant the "climate sceptics" are. They simply aren't part of the scientific debate - "is it happening, and is it caused by us" is just not an interesting question these days, and hasn't been for some time now. That's not to say there aren't plenty of interesting questions to ask, but in terms of policy decision these are things like: how bad the effects of climate change are going to be, what sort of policy decisions will be effective in reducing emissions, and how we should trade off the welfare of future generations against the current population. I suppose the very last sentence of Black's 10th talking point hints at some of this ("And some economists believe that a warmer climate would, on balance, improve lives"), but up to that point the whole page was just red herrings. Incidentally, I was amused to read that Steve "Junk Scientist" Milloy wasn't able to find a single Climate Sceptic in the whole state of Texas. Of course it's long been clear that they were a dwindling band of "gone emeritus" types shouting well above their weight, but this is a rather nice demonstration of that fact. The resounding defeat of the Australian Govt could be (and in some quarters, is) seen in a similar light. Whether or not the successor there will actually do anything, or just talk a good talk and then continue business as usual (eg) is another matter. But I'm digressing. Anyway, another of Richard Black's articles was an investigation into "censorship". Some time ago, he asked for any evidence to back up the occasional claims that the reason why there is no sceptical science is because it is censored by the gatekeepers of the peer-review system. Apparently someone (several people?) had pointed him towards my multiply-rejected paper "Can we believe in high climate sensitivity", so he phoned me up for a chat about it. As is clear from his article, I don't really see this as "censorship of scepticism" so much as gatekeepers doing their usual thing of defending the status quo. In fact as I blogged at the time, a fair proportion of the reviewers actually supported publication, it was the journal editors who seemed to be the main obstacle (and to those who claimed at the time it was "unethical" to discuss reviews, Hansen doesn't seem to think so). I do think that the need to create and support a "consensus" on climate science has acted to stifle debate on the issues we have tried to raise. I expect that had we found an "exciting" result, the publishing world would have been more receptive, but (as that last link shows) even Hansen has trouble when he tries to push the Overton window too far. Ultimately the story probably has more to do with personal politics than some global conspiracy. In a recent survey of 140 climate scientists, 18 percent found the IPCC too alarming but 82 percent either thought the IPCC represented a reasonable consensus – or said it was not alarming enough. No one agreed with the statement that global warming is a fabrication and that human activity is not having a significant effect. I blame the Port Lockroy porridge. Let them eat whale - there's plenty of it stockpiled up. Jim Giles had an article in NewScientist on open access publishing recently, along somewhat similar lines to his article in Nature earlier this year. However, this time it's a comment article rather than mere news, so he's prepared (allowed? Nature's hostility to open-access is hardly a secret) to present his point of view, which is that open access is the way forward. I agree with what he says, although think he misses a detail in his presentation of the matter as one of paper charges versus subscription fees. Many journals charge both! So in fact we are already paying the journals $1000-$2000 to take our work, hide it behind a paywall, and sell it for their own profit. Since I had it handy, I just checked that the 4-page Comment on Schwartz will cost about $2000 for standard publication (in JGR) assuming some use of colour. In fact I see the AGU has just instigated a new experimental system whereby we can pay the same again (roughly) as an additional charge to have the article made freely available to all readers. So that would make it $4000, just for a short comment. Think I'll pass on that second option, as the AGU (in common with essentially all publishers) do not prevent authors putting papers on their own web sites anyway. Google will usually find the full text for recent and even forthcoming papers these days (old pre-web ones are harder to track down). The EGU open access journals somehow manage the whole process far cheaper - and I don't think they are heavily subsidised by the EGU itself, at least not in the long term. Their page charges are about €20 per page. Even with their small pages this is lot less less than the AGU ask for (an order of magnitude cheaper than the AGU's free-to-view version), and right at, or even below, the bottom of the range of cost that Jim Giles suggests. I also like their open reviewing system. Now that several of their journals are well-established, it looks like an obvious place to send manuscripts on a wide range of topics. The only thing I really don't much like about their system is that the papers are only available as (awkwardly-formatted IMO) pdfs and not directly as html. But this is a bit of a detail. Sadly, they don't yet have a journal for what I would think of as the bulk of climate science itself (there's clearly a demand for it, as I've seen the occasional paper that I would class as mainstream "Climate Dynamics" material in rather tangentially-related journals like ACP and CP). Japan's largest language school - I use the term loosely - folded recently, leaving many foreigners stranded here with no means of support. I can't be bothered blogging about that but it's quite an interesting story in its own right. Anyway, some of the teachers have started offering lessons in exchange for food, presumably as a publicity stunt cos no sane person who was desperately short of cash would ask for a restaurant meal rather than the equivalent money. "How demeaning that must be", I said to the person standing beside me, as I helped myself to the plate of canapes in the British Embassy, at last night's reception for a visiting dignitary. "What sort of person would go and talk English to random acquaintances for a couple of hours just for the sake of a free feed?" "The Conservatives have set out plans which they say will ensure children can read by the age of sixteen." Actually they said six, not sixteen. I wonder how that would go down in Japan, where the curriculum covers the most basic 2000 kanji (not enough for true reading fluency by any means) by the age of about 16. Jules's boss (who has several children) mixed disbelief and astonishment when Jules mentioned some time ago that she could read before she went to school - "that's not normal, is it?" Of course there are different interpretations of what it means to be able to read. I wouldn't expect a British 6 year old to be able to handle the more sophisticated newspapers or novels. But I find it hard to understand a world in which secondary school pupils also cannot read these things! So that explains how Schwartz got published in the first place. Actually I had the dubious pleasure of reviewing another article out of this collection. It took me all of 5 minutes to spot the mistake, and little longer to write the review which explained it in simple terms. I declined the offer to look at a revised version, so it is not impossible that the published paper will be better, but I am not holding my breath. Who needs Energy and Environment when JGR will publish this stuff anyway? Of course I shouldn't tar everyone with the same brush: there are probably some good papers in this issue, maybe even most of them. But Chylek, Essex, Scafetta and West at least all have previous form, and we've shown that the Schwartz paper was wrong. I wonder how many more comments this Special Issue of JGR will provoke? "the government recognized suicide as a death of a person... who is at the end of their rope"
The govt has released a white paper on the suicide issue (Japan is 9th in the world). With a characteristic lack of attention to punctuation and clarity, Japantoday reported that the government "stressed the need to tackle the issue of suicide by society as a whole". In unrelated news, an international survey of gender inequality by the World Economic Forum placed Japan an embarrassing 91st out of 128 countries - just below Zimbabwe, Malawi and Nicaragua (well, I think they should be embarrassed, in my culturally-imperialistic way, but I see no signs of them actually being embarrassed). Hmm, maybe there's something in that "suicide by society as a whole" thing after all. Via Tom Adams, who first noticed that Bush had abolished global warming back in February, I see that the existence of global warming is now no longer disputed in the Whitehouse. At least as a phrase in documents. Well, it's a start. Welcome to Planet Earth, Mr President. I suppose that means I am longwinded and incomprehensible. Who'da thunk it? Update: Oh no - this post has dropped me to a mere post-grad - I guess that just shows that blog memes are bad for your intelligence. I'd better add something pretentious about a Transformative Hermeneutics of Quantum Gravity or carbon dioxide production by benthic bacteria. Incidentally, the latter apparently fooled Benny Peiser who circulated it on his mailing list, but unfortunately people spoilt the fun by quickly pointing out it was a hoax before the likes of Inhofe or Crichton had a chance to pick it up. Desmogblog lists the gullible. The culture of the Northern Hemisphere evolves from west to east with a discontinuity at the international date line. Of course this wouldn't hold up to detailed scrutiny since all I am really doing is comparing North America, Northern Europe and Japan. The simplest example, and the one I usually trot out when people ask "so what's Japan like?" is the Starbucks chocolate brownie inter-comparison project (SCBIP). In the USA and Canada you're talking a 3 inch by 3 inch square, in Europe a 3 inch by 1.5 inch rectangle and in Japan a 1.5 by 1.5 inch square. Another example is the number of times per sentence that a person says "I". In Japan that's almost never, in Europe maybe it is 1 sentence in 2 and here at Seattle airport (where I'm writing this) it is about twice per sentence, and loudly. There are many more examples but that second one brings me to the second special Japanese behavioural characteristic (the first being moe). This one, which perhaps comes from putting societal gain before personal gain (hence the link to the preoccupation with "I"), seems more like a resource than an emotion and it is called "gaman". Linguistically it is an activity as in "gaman dekinai" = I can't do gaman. Gaman is all about putting up with things, it is patience and self-denial rolled up together. It is part of what makes society run so fantastically smoothly in Japan, although of course it is therefore also what keeps corrupt and incompetent people in power. The thing I don't know about it is whether it is true masochism - pain-without-gain - or whether people feel some sort of reward, whether they feel they are doing it for societal good, or rather out of duty. Since an obedient person is a beautiful one, I suspect there is some pleasure gained from it even if people do it only out of duty. So, continuing the NHemisphere evolution with longitude theory, while Americans complain at the slightest discomfort (~60% of US births involve an epidural), the Brits whine endlessly to those around them but don't actually make a public fuss quite so often (~40% epidural) but the Japanese don't merely not complain but generally smile through it (you pretty much have to choose a special hospital that caters to westerners if you want the possibility of *any* pain relief with child-birth). Of course in childbirth there is a perceived gain, but gaman is everywhere - the smiling shop worker who stands in her stilletos the whole day long yet offers perfect patient service, the salaryman working ridiculously long hours and sacrificing his weekends to lose convincingly at golf to clients of his company, the game of sardines played peacefully each day on the trains, putting up with your funny gaijin neighbours (that's us!)... On that last one, I told some American friends of my Dad in Boulder (where I've just been on hols) that I wasn't sure if we disturb our Japanese neighbours playing movies at night, and she asked me if they bang on the walls. She said this like such a thing might be a hint, but not necessarily proof! I was stunned. Of course they don't bang on the walls, or complain in any way that is apparent to me, but that doesn't mean we don't disturb them. I think I can do moe a little but gaman I'm no good at at all. When I get a headache I take a painkiller. I can do some minor pain-with-gain. For example, I like wearing myself out cycling and climbing mountains. It is not always fun in itself (although it often is) but there are so many gains - great views, a feeling of being fit, a big dinner, and maybe a day recovering lazing round at home. But pain-without-gain, which I suspect is true gaman, I am nowhere near mastering. When my boss (who appears to have an infinite resource of gaman and no sense of time whatsoever) carries on a meeting 5 minutes over its scheduled time I start to get shuffly, and at 20 minutes I complain and at 30 I stake a claim to the canteen and force an end to the meeting. I think there may be some pride in gaman, the evidence being incidents such as a number of meetings I have attended, which have been concluded by others making statements like "Julia is bored" or "Julia looks hungry". If nothing else this means my inability to do gaman is all too obvious to all around. Another of my "just writing it so I can use the title" posts, perhaps :-) But having ranted about them a couple of times in the past, there's no harm in taking this opportunity to say something a bit more conciliatory. Before anyone thinks I must have gone soft in the head, I should emphasise that this post does not mean that I'm going to stop teasing them if they say things in the future that I think are foolish - in fact they have a howler currently in press that I'm looking forward to blogging about when it appears. But criticism should be well targeted, and I think Stoat misses the mark in his recent posts about this paper. Clearly they have had some jolly fun dividing the runs up into trees, but the paper is a disappointment to me, as it doesn't really deal with the main issue, which is the physical plausibility of some of the runs. While I agree pretty much with Stoat's characterisation of "the main issue", I don't have a problem with papers that do not address this, so long as they do not oversell their results as having any meaningful applicability to the real world (which is probably a valid criticism of the original "sensitivity might be 11C" paper, but not the one under discussion here). In fact this "main issue" is an incredibly complex one to address. It is effectively the crux of the whole climate prediction problem (and many more prediction problems besides). The issue can be roughly restated as "how good/bad does a model have to be before we trust/distrust its output" or perhaps more precisely as "how do we make meaningful inferences about reality, given the output of some model runs, none of which really looks much like reality if you examine it in any detail". It is certainly not as simple as just choosing (discovering?) some convenient "objective criterion" (or a laundry list of such criteria) against which to measure our models, although such criteria may provide some guidance. (As one adds more criteria to the list, the number of models that pass all of them will simply drop to zero - at what point do we decide to stop?) And although some of us have been thinking about this question for a few years already, it may be a few more years yet before we start to agree on some answers. But meanwhile, there is also plenty of more technical work to do, and so long as they are doing something interesting and valid, I don't think it is fair to criticise papers simply because they did not address the particular problem that you would like them to. The basic gist is that an astrophysicist called J. Richard Gott III claims to have discovered a principle by which the future duration of an ongoing event can be confidently predicted, with absolutely no knowledge other than the past duration. In particular in this article, he asserts that the human race doesn't have long left on Planet Earth, and further, that the human space program doesn't have long left either, so we had better get on with colonising somewhere else. It's basically a warmed-over version of the Doomsday "argument", of course - one version of which is that given a total number of N humans (over the entire lifespan of the species), I can assume that with 95% probability my position in the list lies in the (0.025N, 0.975N) interval. Actually, I am number 60B in the order, meaning that I can expect there to be somewhere between 1.5B and 2400B more people (with 95% probability). That means a 2.5% probability that we'll be extinct in the next few decades! Gott does the same thing with the number of years during which there will be a space program, and works out that it is likely to end quite soon, so we had better get on with moving elsewhere while we can. Brian Weatherall rips a hole in it, first with a bit of "mockery" (his term) about how it leads to idiotic predictions for several examples such as the durability of the internet or the iPhone (and if anyone doesn't think these predictions are indeed idiotic, I'll happily bet against them as he offers to), and then with a simple example as to how it leads to the following nonsensical claim: if A has a longer historical duration than B, then the future duration of A will certainly (with probability 1!) be as long as the future duration of B - he does this by considering the durations of the events A, B, and "A and B". “There are lies, damn lies and statistics” is one of those colorful phrases that bedevil poor workaday statisticians who labor under the illusion that they actually contribute to the advancement of scientific knowledge. Unfortunately, the statistical methodology of astrophysicist Dr. John Gott, reported in Nature 363:315-319 (1993), which purportedly enables one to put statistical limits on the probable lifetime of anything from human existence to Nature itself, breathes new life into the saying. Dr. Gott claimed that, given the duration of existence of anything, there is a 5% probability that it is in its first or last 2.5% of existence. He uses this logic to predict, for example, the duration of publication of Nature. Given that Nature has published for 123 years, he projects the duration of continued publication to be between 123/39 = 3.2 years and 123×39=4800 years, with 95% certainty. He then goes on to predict the future longevity of our species (5000 to 7.8 million years), the probability we will colonize the galaxy and the future prospects of space travel. Simply put, the principle of indifference says that it you know nothing about a specified number of possible outcomes, you can assign them equal probability. This is exactly what Dr. Gott does when he assigns a probability of 2.5% to each of the 40 segments of a hypothetical lifetime. There are many problems with this seductively simple logic. The most fundamental one is that, as Keynes said, this procedure creates knowledge (specific probability statements) out of complete ignorance. The practical problem is that when applied in the problems that Dr. Gott addresses, it can justify virtually any answer. Take the Nature projection. If we are completely uncertain about the future length of publication, T, then we are equally uncertain about the cube of that duration, T cubed. Using Dr. Gott’s logic, we can predict the 95% probability interval for T cubed as T3/39 to 39T cubed. But that translates into a 95% probability interval for the future length of publication to be T/3.4 to 3.4T, or 42 to 483 years, not 3 to 4800. By increasing the exponent, we can come to the conclusion that we are 95% sure that the future length of anything will be exactly equal to the duration of its past existence, T. Similarly, if we are ignorant about successively increasing roots of T, we can conclude that we are 95% sure that the future duration of anything will somewhere between zero and infinity. These are the kind of difficulties inherent in any argument based on the principle of indifference. On the positive side, all of us should be encouraged to learn that there can be no meaningful conclusions where there is no information, and that the labors of scientists to predict such things as the survival of the human species cannot be supplanted by trivial (and in this case specious) statistical arguments. Sadly, however, I believe that this realization, together with the superficial plausibility (and wide publicity) of Dr. Gott’s work, will do little to weaken the link in many people’s minds between “lies” and “statistics”. 1. Hacking I. The Emergence of Probability, 126, ( Cambridge Univ. Press, Cambridge,1975). 2. Howson C, Urbach P. Scientific Reasoning: The Bayesian Approach, 100, (Open Court, La Salle, Illlinois, 1989). 4. Oakes M. Statistical Inference: A commentary for the social sciences, 40, (Wiley, New York, 1986). Apparently back then, Gott's argument was sufficiently novel that Nature did not feel able to argue that "everyone thinks like this, so you can't criticise it" :-) More likely, the lesser political importance of the topics under discussion meant that they did not feel such a strong need to defend a "consensus" built on such methods. Regular readers will probably by now have recognised an uncanny resemblance between Gott's argument and the "ignorant prior" so beloved of certain climate scientists. Indeed both succumb to the same argument - Goodman's demonstration of inconsistency via different transformations of the variable (duration of Nature magazine) is exactly what I did with Frame's method. Of course I wasn't claiming to have discovered anything new in my comment, but it's interesting to note that essentially the same argument was thrashed out so long ago right there in the pages of Nature itself. It doesn't seem to have slowed down Gott either, as he continues to peddle his "theory" far and wide.